Gannett wants to take over fellow newspaper owner Tribune Publishing. On Monday morning, Gannett went public with a bid, saying its initially private entreaties have been rebuffed. Gannett (GCI) is offering to pay roughly $815 million in cash for Tribune (TPUB), at $12.25 a share, which is a 63% premium based on Tribune's closing price of $7.52 a share on Friday. "Given the substantial value represented by our offer and the other compelling benefits of a combination of Gannett and Tribune, we are confident that Tribune's non-management stockholders will support our proposal," Gannett CEO Robert Dickey wrote in a letter to Tribune CEO Justin Dearborn. In other words, Dickey is forcing the issue by taking his take-over battle public. The company broke the news through an article on its flagship web site, USA Today. Investors reacted as expected: Tribune stock jumped up 55% in morning trading, approaching the $12 mark. Tribune issued a statement about 45 minutes after Gannett went public. The company said it is not refusing to negotiate, but it needs time to get all its legal and financial ducks in a row. "The Board is now engaged, with the assistance of its advisors, in a thorough review," Tribune said. "The Board is committed to acting in the best interests of shareholders and will respond to Gannett as quickly as feasible." A merger would unite two big but troubled newspaper operators, and further consolidate an industry that is already largely controlled by just a few companies. Tribune Publishing owns the Los Angeles Times, Chicago Tribune, Baltimore Sun, and other daily newspapers. Gannett owns USA Today, the Detroit Free Press, Des Moines Register, Cincinnati Enquirer, and more than 100 other smaller local media brands. Both Gannett and Tribune used to have big television station operations too, but the newspaper divisions were spun off as their own companies. So now the paper owners are more exposed in an increasingly difficult media climate. Gannett has been seeking to get bigger. Earlier this year, the company acquired Journal Media Group, which includes the Milwaukee Journal Sentinel and the Commercial Appeal of Memphis. "The challenges for our industry in the digital age continue," Dickey wrote to Dearborn. He continued: "By combining, we would create a company with the financial stability and flexibility equipped to preserve journalistic integrity, high standards and excellence for years to come. We would be able to both empower our journalists and facilitate the creation of exceptional content while delivering stockholder value." Dearborn has been on the job for just two months. He unexpectedly replaced Jack Griffin as CEO in February. 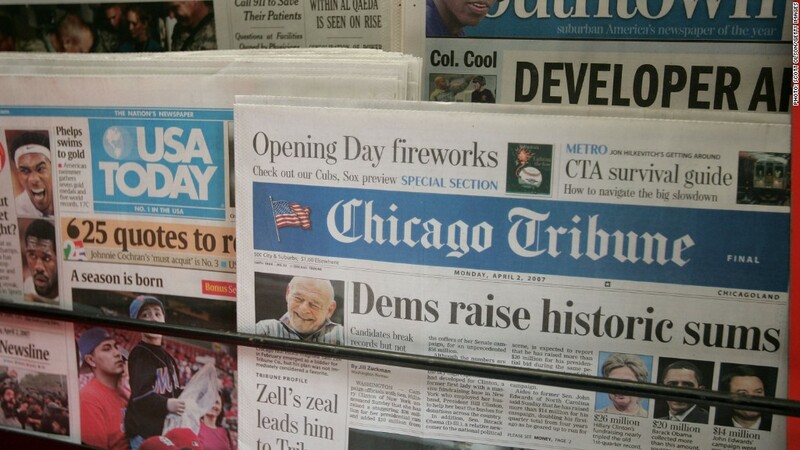 Dearborn likely wants more time to implement this brand-new strategy for Tribune. But the "unprecedented hostile offer" from Dickey will be hard to refuse, industry analyst Ken Doctor wrote on Monday morning. A Gannett takeover would have implications for local efforts to take over the Los Angeles Times. For well over a year now, a group of Los Angeles power brokers led by billionaire philanthropist Eli Broad have been scheming to acquire the Times and other Southern California papers and turn them into a privately owned company dominating the Southland media market. The Gannett bid for Tribune is a setback for those ambitions.